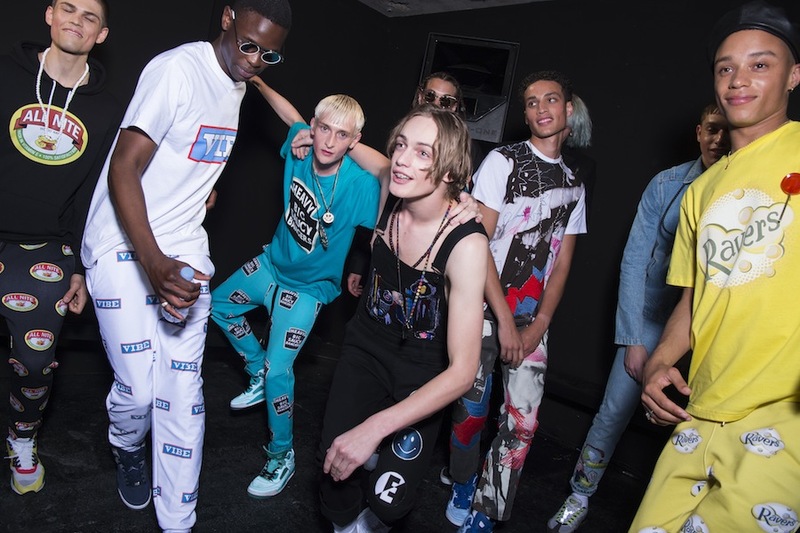 Clash unpacks the sights of SS17. 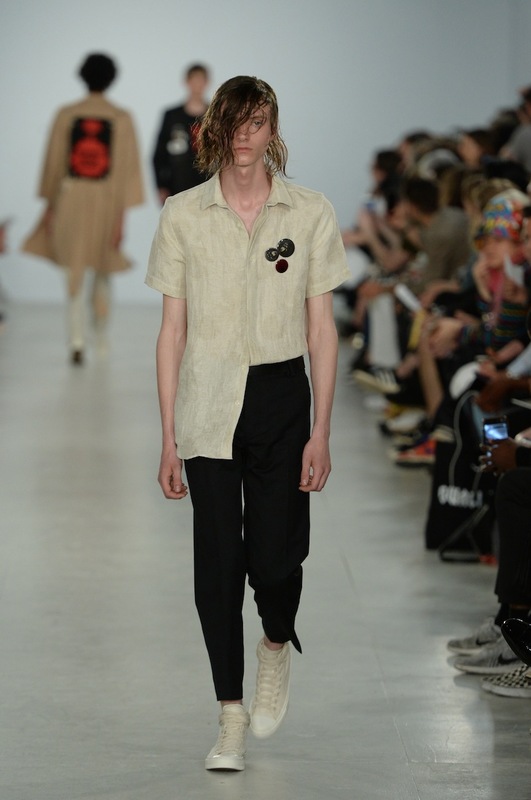 The invitation to Sibling’s SS17 show looked and read like a postcard from the 1950’s: ‘Greetings from SIBLING, The Land of Sunshine’. 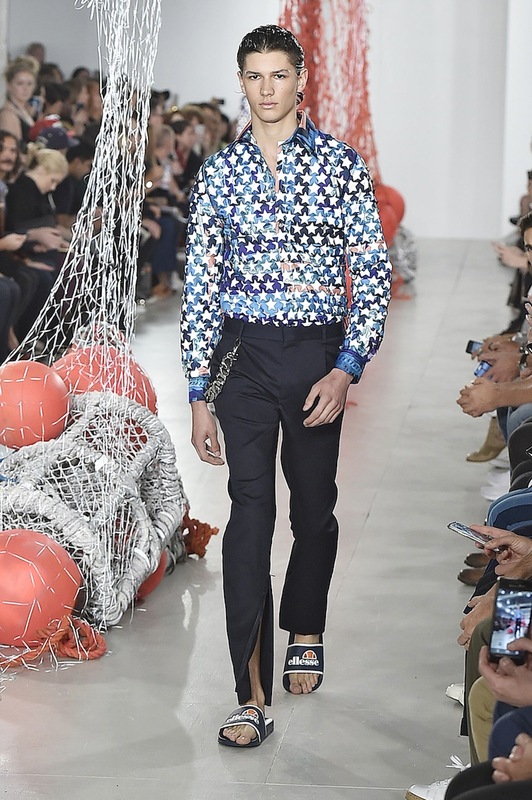 It was perhaps the first indication of the mood that would fill London Collections: Men’s four day showcase, with designer’s advocating the need for a holiday next season. 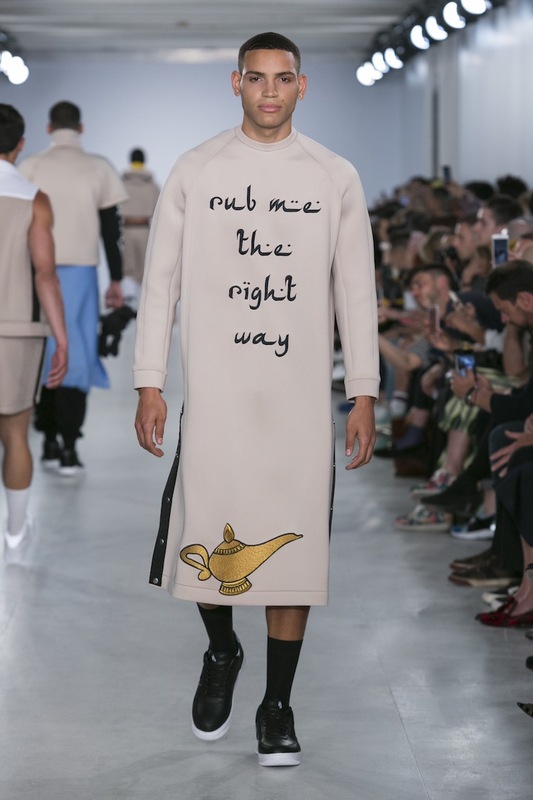 A nod to the on-going debate about the necessity of fashion weeks and speed at which the industry is paced, the departure of big names like Burberry from the schedule, and the news from Sibling’s own HQ that the duo will be doing as the Italians and closing the studio throughout August, London’s designers, subconsciously or otherwise, collectively focused their attentions on wares that wouldn’t look out of place on the Costa del Sol. 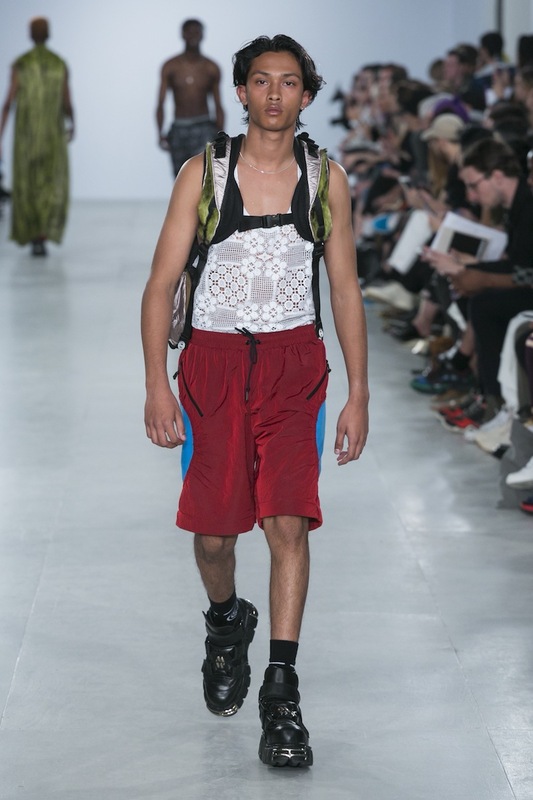 Hardly perceptive you might reason, given that the season’s double S stands for Spring Summer and the sight of bare flesh on the catwalk is a pretty consistent occurrence: regardless, the emphasis was powerful. 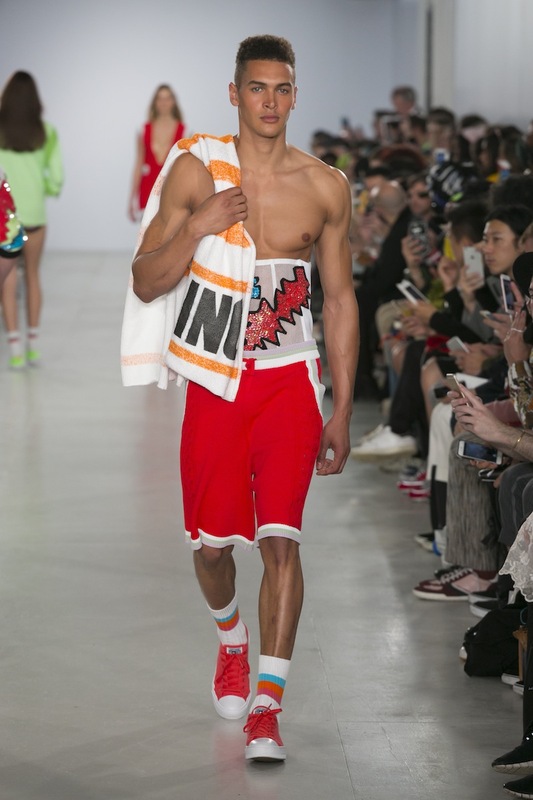 House of Holland’s third menswear outing borrowed from ‘Supermarket Sweep’ and Manchester’s Hacienda, with Henry’s taste for bright colours and bold graphics manifesting itself via pieces that replaced Marmite and Quavers branding with slogans ‘All Nite’ and ‘Ravers’; model ensembles for that trip to Ibiza you and the boys have all but finished planning. 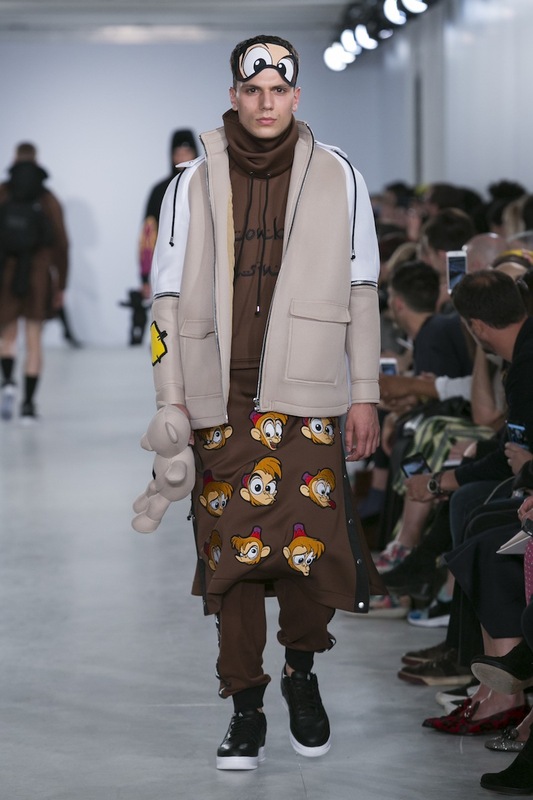 Bobby Abley meanwhile, invited us to ride Magic Carpet Airways – a play on Disney’s ‘Aladdin’ – employing the invite as a boarding card; he debuted a selection of in-flight accessories (read: eye masks and neck pillows) alongside neoprene tunics and tops that brandished public toilet signs as embroidered motifs. 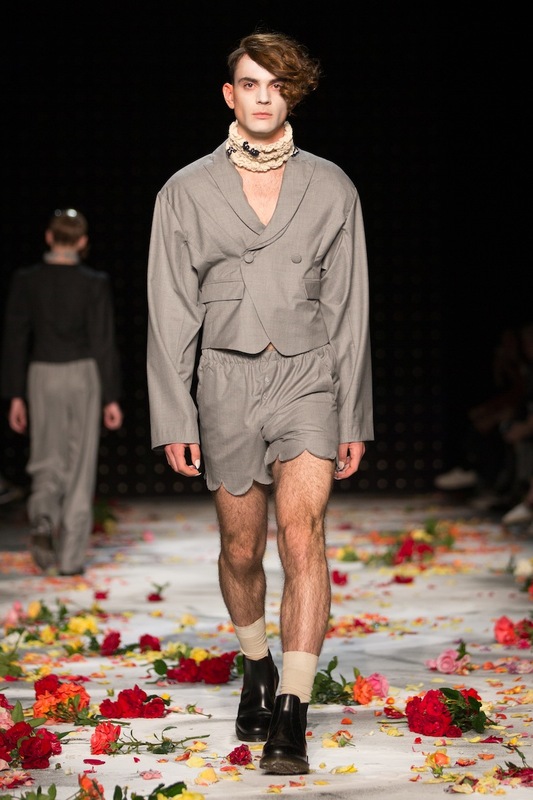 Inspired by the work of Felix Gonzalez-Torres (as he explained to Clash last week, here), Sebastiaan Pieter’s models flaunted tanned torsos and silver swimming trunks, the latter in a manner not dissimilar from the early noughties trend for women to flash the top of their thong above their jeans, albeit executed here in a tasteful manner. 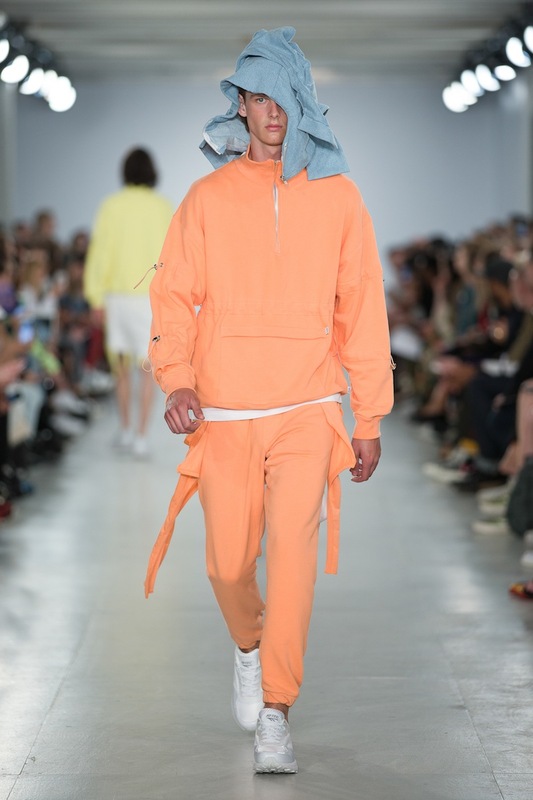 With Wolfgang Tillmans and Gosha Rubchinskiy looking on, Cottweiler’s first catwalk show saw designers Ben Cottrell and Matthew Dainty further explore the sports as contemporary aesthetic that has become a vital facet of the label’s handwriting. 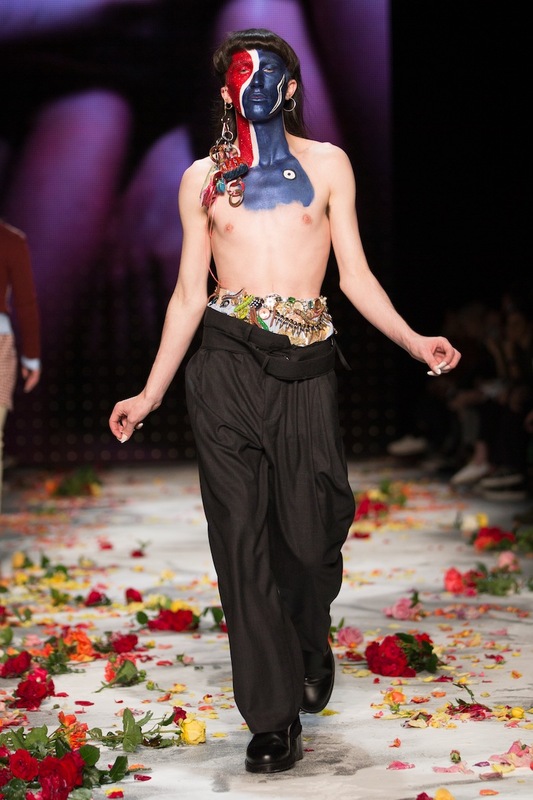 With a maid’s towel cart installation parked halfway up to the show space, tea towels dripping from waistbands, and a catwalk strewn with broken ceramics, beyond the garms was a nod to Inbetweeners style trips: the broken bowls readable as either a reference to Mediterranean traditions or the typical building site hotels of lads on tour tales. 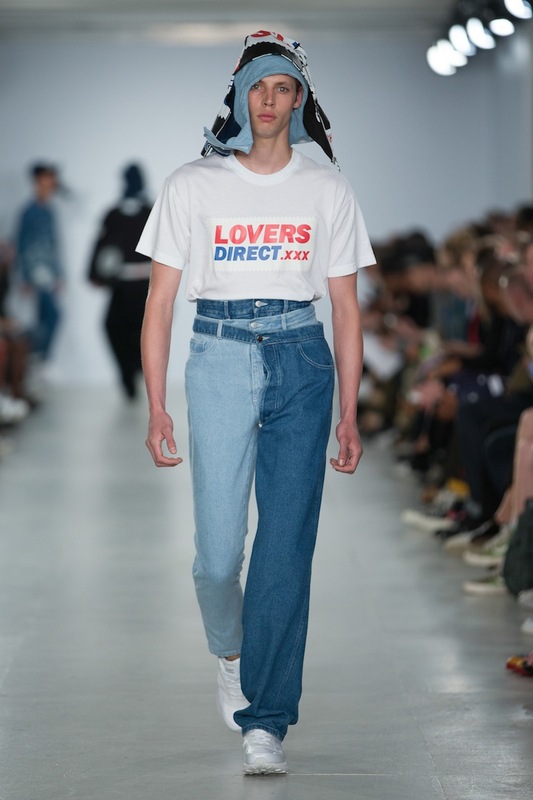 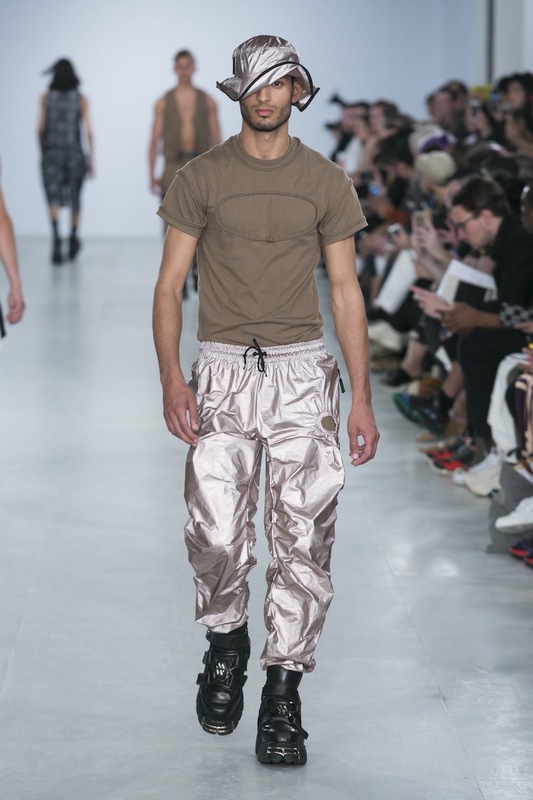 At Christopher Shannon’s Sunday show, his return to the format (following last season’s static presentation) was greeted with collective praise; the Sports Direct alike ‘Lovers/Haters Direct’ graphics that covered tees, sweatshirts and shoppers were a favourite (boasting Insta applause too), while elsewhere his focus on denim – with multiple layers and fastenings – honoured the work of Robert Mapplethorp; the washed out bright sweats in-keeping with last season’s Essex boy. 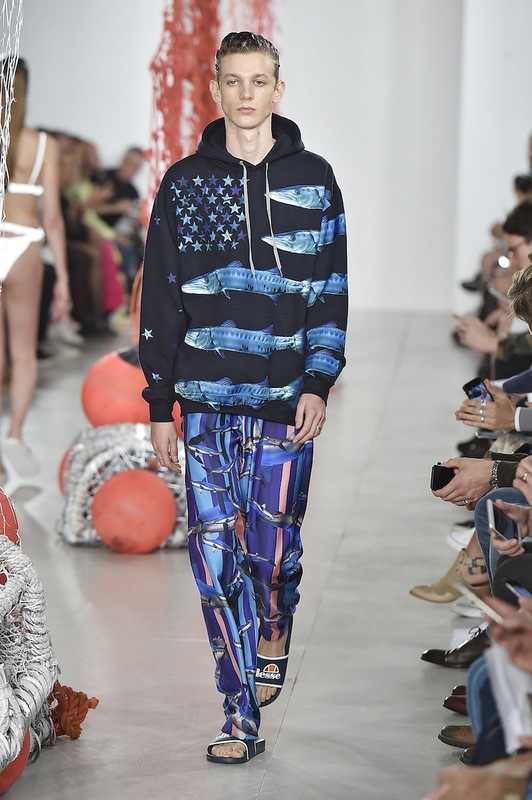 At Katie Eary meanwhile, the pairing of heavily gelled do’s and Ellesse sliders with smart trousers and silk shirts made for a fierce interpretation of a visually pleasing holiday maker meets bar tender style romance, emphasised by the women’s looks that accompanied the male line up (the bulk of which were bikinis). 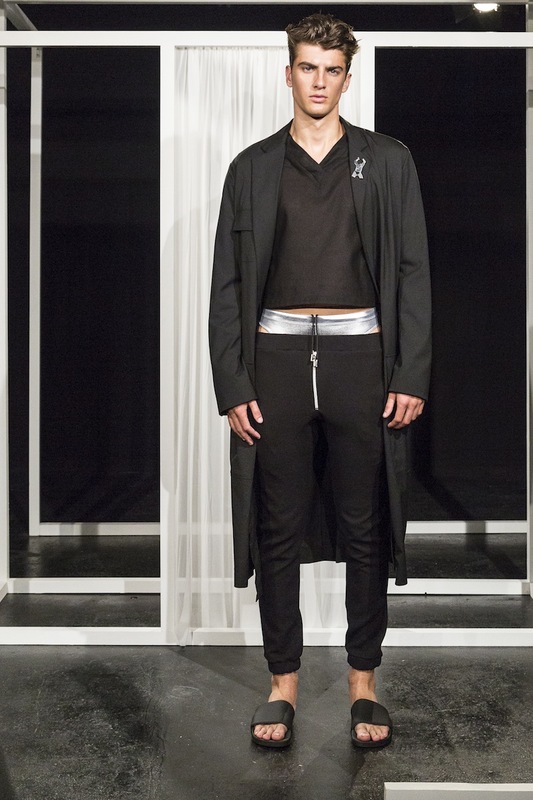 Of course no trend can ever quite be ubiquitous, and for those designers not planning a summer vacay, the ICA’s upcoming Judy Blame retrospective lent itself as a common thread, as loose references to the stylist, designer and art director’s magpie like approach shone through. 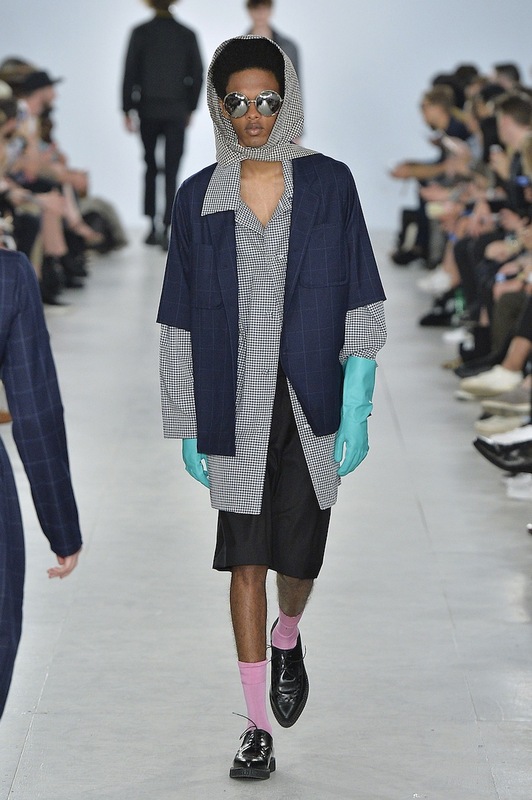 At Agi & Sam, who worked with florists Grace & Thorn on fantastic face furniture and presented layered looks of check prints, this was felt in the styling, with brightly coloured marigolds poking out from under sleeves and a series of cameo brooches adorning jackets. 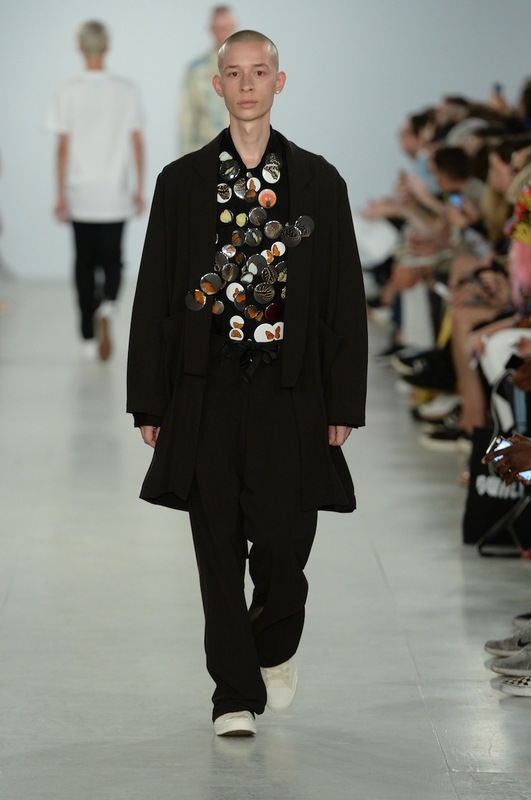 At Matthew Miller, a flock of badges played companion to numerous shirts and jackets. 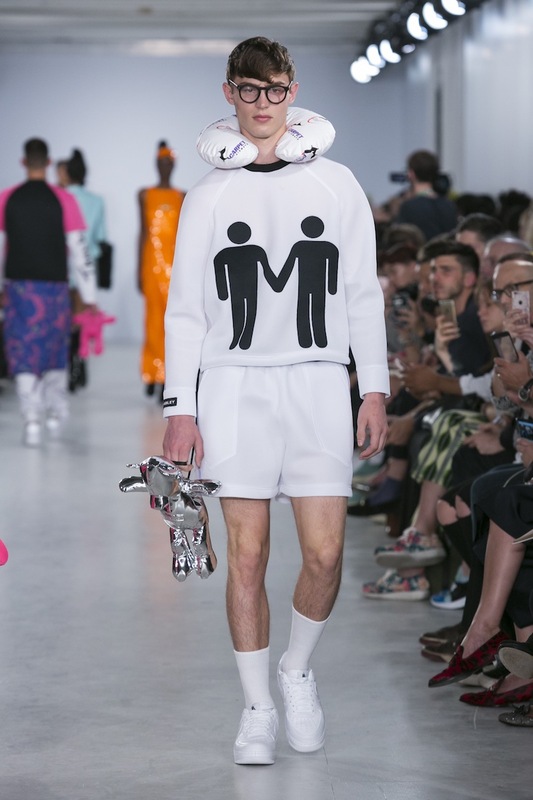 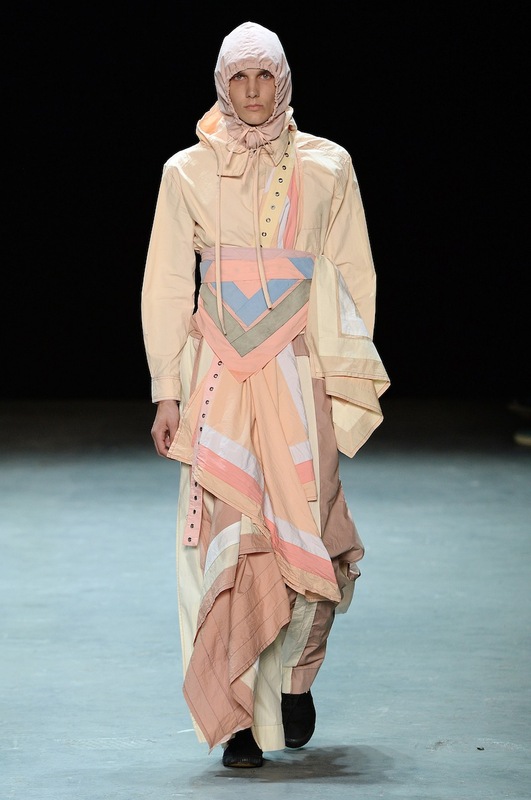 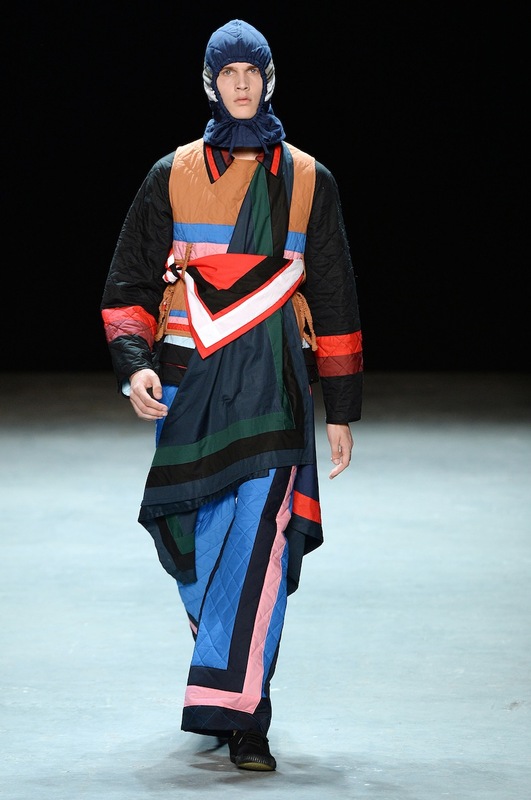 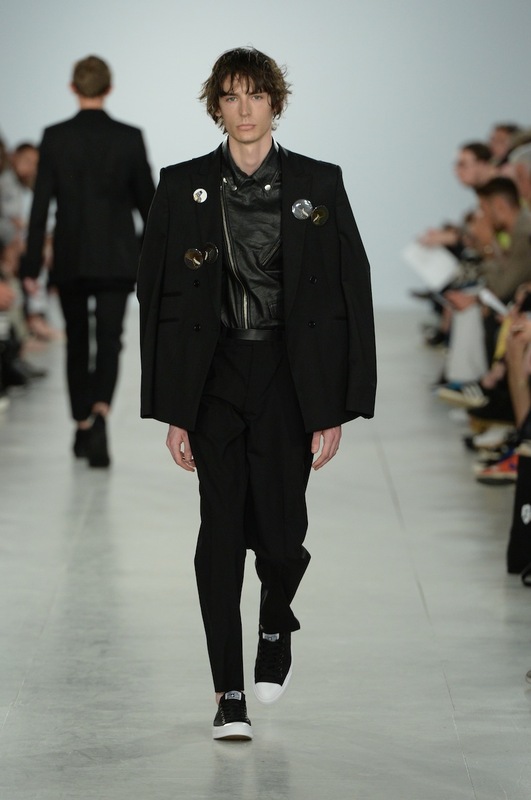 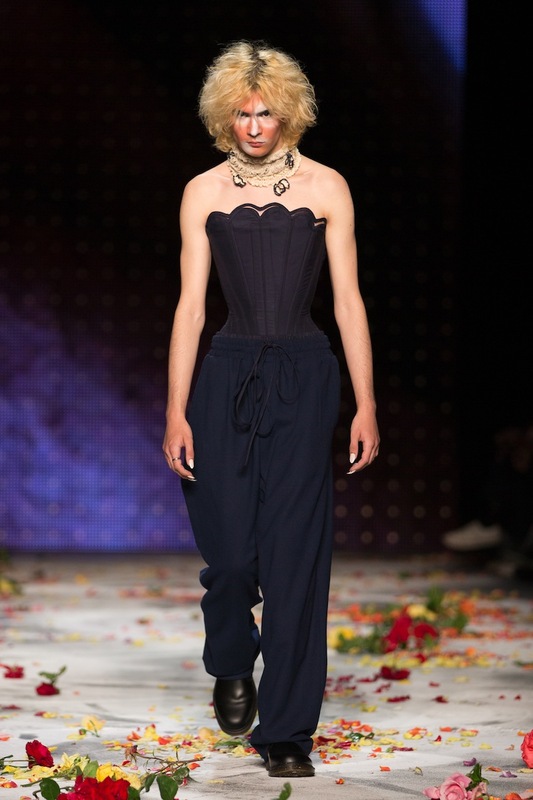 For Charles Jeffrey, whose Loverboy label made its second catwalk appearance as part of MAN, Blame’s status within club culture was an obvious tie in – the correlation between the two bigger than SS17 – but on a simplified level, Jeffrey’s atmospheric display (roses cluttered the catwalk while a striking clock played out the finale), noted Judy most prominently with a focus on metal trinkets, examples of which grabbed necks and covered shorts. 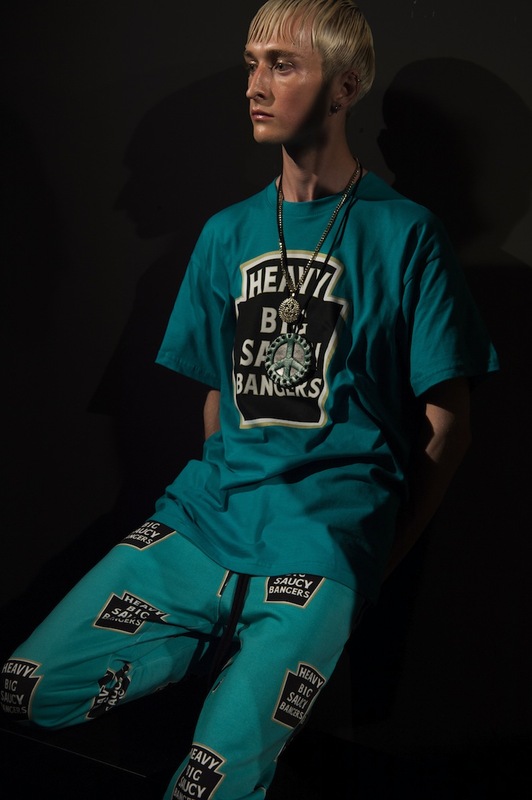 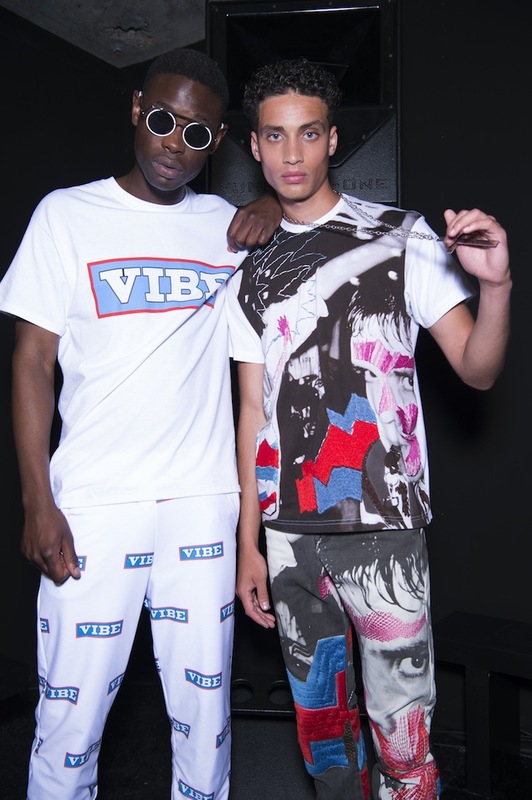 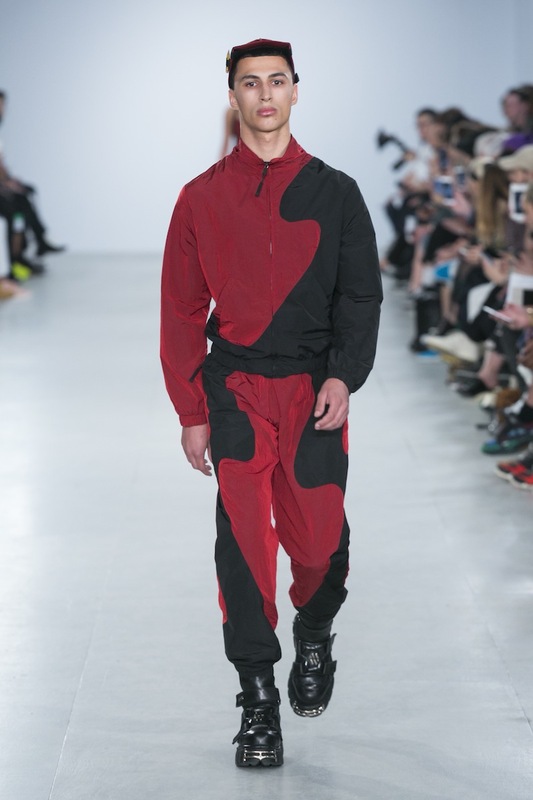 Finally there was Craig Green and Nasir Mazhar, two labels with substantial house codes. 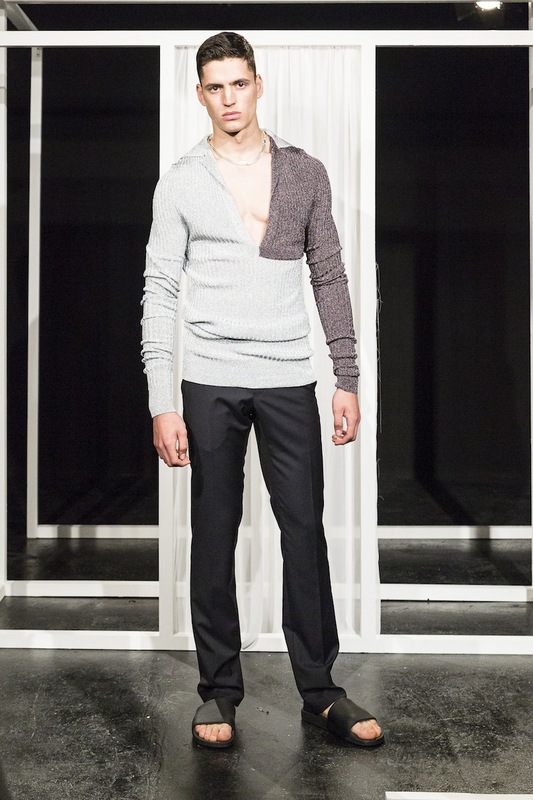 Formally merging his men’s and womenswear collections, Mazhar premiered a new hat design (the infamous box peak cap also made an appearance), while this season his palette was far reaching, as neutral tones partnered bright shades and metallic textures; a feminine crotchet/lace fabric was also introduced, used for vests and tracksuits alike. 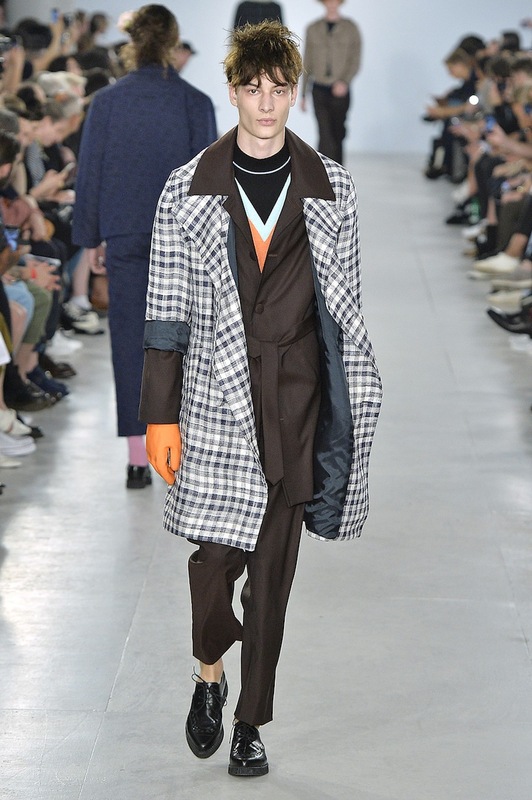 Teaming up with the composer Frédéric Sanchez on this season’s soundtrack, Craig Green’s evening performance, if you will, saw the designer riff on popular in-house themes – XL shapes, lacing and quilting – while for a show of newness he forwent his usual stance on block colour, producing a series of looks that married varying shades: the first bold and bright, the second those same dyes washed out to the point of pastels. 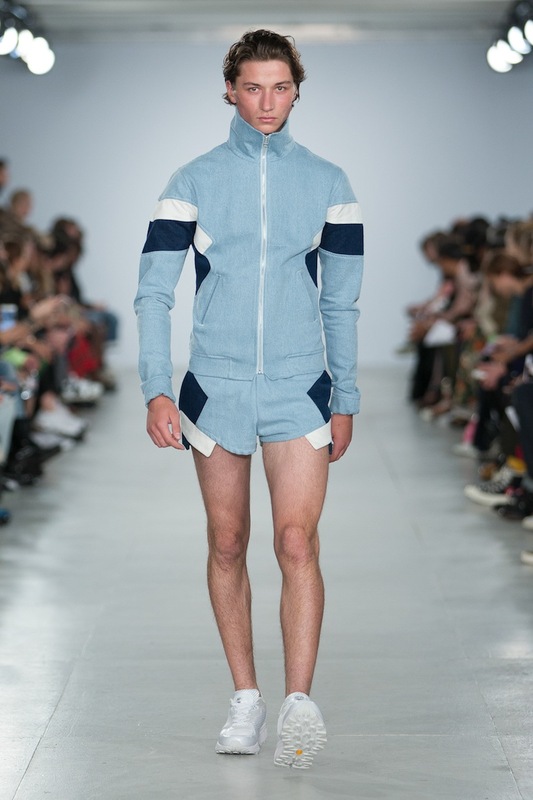 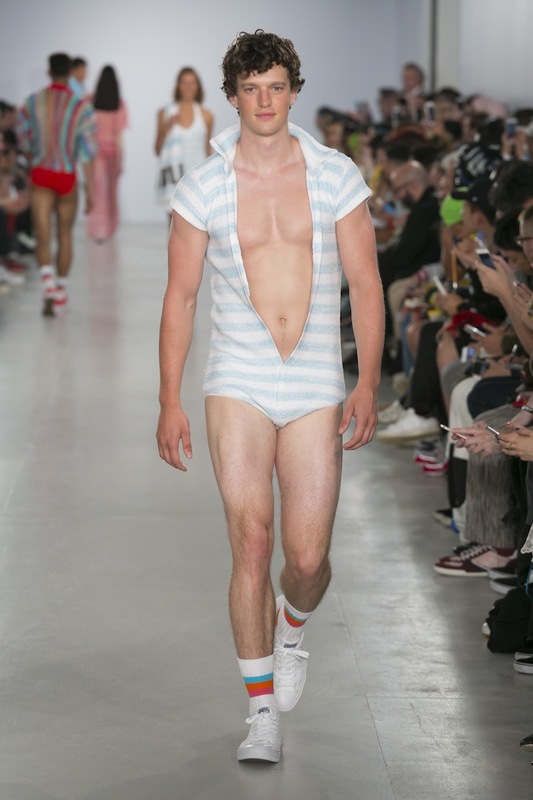 As ever, and for the recipient of this year’s BFC/GQ Designer Menswear Fund, perhaps not strictly a surprise, his was one of the season’s absolute highlights.